Americas gateway to the universe. Leading the world in preparing and launching missions to Earth and beyond.Sept. 8, 2000 John F. Kennedy Space Center Spaceport Newshttp://www-pao.ksc.nasa.gov/kscpao/snews/snewstoc.htmVol. 39, No. 18 Page 6  New helium pipeline to save space program money. 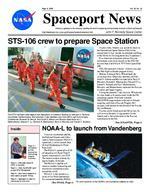 Page 6  Spaceport to open to community for first time. Page 2  VAB Safe Haven fit check a success. Page 5  Innovators at KSC honored at Technology Awards luncheon. Page 3  New AutoPGHM used to load STS-106 payload.InsideSTS-106 crew to prepare Space StationNOAA-L to launch from Vandenberg(See ATLANTIS, Page 4) (See NOAA, Page 4) A new environmental satellite, the National Oceanic and Atmospheric Administrations NOAA-L spacecraft, is set for launch Sept. 20 from Vandenberg Air Force Base, Calif. The NOAA-L spacecraft will lift off aboard an Air Force Titan II launch vehicle at 6:22 a.m. EDT. The launch window extends for approximately 10 minutes. The NOAA-L satellite will improve weather forecasting and monitor environmental events around the world. NOAA-L is the second in a series of five Polar Operational Environmental Satellites (POES)An artist rendition of the NOAA-L environmental satellite on orbit. The STS-106 flight crew departs the Operations & Checkout Building to take part in Terminal Countdown Demonstration Test activities. Crew members are, from left to right front to back, Commander Terrence W. Wilcutt, Pilot Scott D. Altman and Mission Specialists Yuri I. Malenchenko, Edward T. Lu, Richard A. Mastracchio, Boris V. Morukov and Daniel C. Burbank.At press time, Atlantis was poised to return to the International Space Station (ISS) for the second time in four months to complete outfitting of the ISS for its first long-term crew, Expedition 1. Five American astronauts and two Russian cosmonauts were set to launch on the STS-106 mission Sept. 8 at 8:45 a.m. EDT from Launch Pad 39B. STS-106 represents Atlantis 22nd mission and the 99th flight in Shuttle program history. Veteran Astronaut Terry Wilcutt leads the seven-man crew. Other crew members are Pilot Scott D. Altman and Mission Specialists Boris V. Morukov, Richard A. Mastracchio, Edward T. Lu, Daniel C. Burbank and Yuri I. Malenchenko. Morukov and Malenchenko represent the Russian Aviation and Space Agency. During the planned 11-day mission, Wilcutt and his crew mates will spend a week inside the ISS unloading supplies from both a double SPACEHAB cargo module in the rear of Atlantis cargo bay and from a Russian Progress M-1 resupply craft docked to the aft end of the Zvezda Service Module. Zvezda, which linked up to the ISS on July 26, will serve as the early living quarters for the Station and is the cornerstone of the Russian contribution to the ISS. SPACEPORT NEWS Sept. 8, 2000 Page 2 Safe Haven fit check successWhile preparing Atlantis for its targeted Sept. 8 launch date, Kennedy Space Center Shuttle managers orchestrated an unprecedented move of the Space Shuttle to the recently renovated west side of the Vehicle Assembly Building (VAB) for a fit check. After the successful fit check of the new Safe Haven, Atlantis was rolled out to Launch Pad 39B. In August 1999, contractors began an extensive two-year renovation project on VAB high bays 2 and 4 and the crawlerway that carries a Space Shuttle to and from the launch pads. The modification was needed to improve KSCs ability to store and protect Shuttle flight hardware during hurricane season and to increase processing flexibility with an upcoming busy launch schedule. Under a $3 million NASA contract, RUSH Construction of Titusville extended the crawler transporter pathway from the VABs east side into VAB high bay 2 on the buildings west side. The 1,250-foot extension was topped off with about 3,000 tons of river rock. Crews also constructed a new orbiter tow-way into VAB high bay 4 on the northwest corner. KWI Construction, Inc. of Merritt Island went to work under a $1.8 million United Space Alliance contract renovating the inside of both western VAB high bays 2 and 4. In high bay 2, crews removed a 125-ton crane, modified the steel frame, and completed significant floor and foundation work  including replacement of the existing Mobile Launcher Platform mounts. Utility infrastructure for electrical, potable water, gaseous helium, nitrogen and compressed air was also installed. KWI also prepared VAB high bay 4 for horizontal orbiter storage capability. A protective canopy was installed above the orbiter storage area and operational communication equipment is now in place. Limited utilities were also installed. With construction completed on schedule in May, engineers only lacked a Space Shuttle fit check to add confidence that their design on paper was fully functional.An aerial view at first light captures a first in Space Shuttle history: A fully stacked Shuttle  Atlantis  is rolled into Vehicle Assembly Building high bay 2 on the building  s west side for a Safe Haven fit check. Below, Atlantis as it enters the high bay. Page 3SPACEPORT NEWSSept. 8, 2000 New AutoPGHM used to load AtlantisWhat is six stories tall, weighs 450,000 lbs, travels only 25 feet and is a vital link in the Shuttle program for placing payloads in the orbiter? The answer is the Payload Ground Handling Mechanism or PGHM (pronounced pigem) for short. The mechanism is located inside the Payload Changeout Room (PCR) of each Shuttle launch pad. The PGHM removes payloads from a transportation canister and installs them into the orbiter. It is essentially NASAs largest forklift. The mechanism also provides access to the orbiter midbody and payloads for repairs and testing. A new and improved PGHM system, called AutoPGHM, was installed last spring and recently was used to load the STS-106 SPACEHAB payload into Atlantis. The AutoPGHM was created through a teaming arrangement of United Space Alliance, NASA and Dynacs. The original PGHM was designed in the late 1970s using the thencurrent design philosophy of pneumatic motors and manual hand wheels to install up to five payloads into the orbiter. Hydraulics was later added to provide for precision control. Then, several years ago, an electric motor with a motor controller was selected and approved to replace an underpowered pneumatic drive motor. With the modification came a renewed awareness of the complexity of the PGHM and the risk associated with its operation. A team was formed to detail the risks and determine methods of reducing or eliminating them. All aspects of PGHM operation were thoroughly studied and analyzed. Improvements were developed and modification packages were created so that they could be accomplished in the relatively small time frames between launches. The PGHM removes payloads from a transportation canister and installs them into the orbiter. It is essentially NASAs largest forklift.Phase 1 of PGHM automation consisted of installing electronically controlled motors in place of the pneumatic motors. To electronically control these new motors, a touch screen and joystick were installed. Motor controllers command the new electric motors to operate at a user-selected speed and direction from the touch screen and activated by the joystick  to an accuracy of one thousandth of an inch. To meet new reliability criteria, two computers are used, one to control all motor functions and the second  acting as a supervisor  to monitor all user inputs and motor functions. Hundreds of safety tests are executed each second by the supervisor, which shuts down the operation if it senses erroneous movements from the motors. To assist in troubleshooting, the supervisor monitors numerous other system functions and displays the status on the touch screen display. To increase safety to flight hardware, new outlets were installed on each of five PGHM levels for installing emergency stop pendants, allowing up to 24 observers to halt motion if a problem is seen. This modification makes operating the PGHM more reliable, reduces the risk of damaging flight hardware, increases personnel safety, and improves operational efficiency.Electronically controlled motors improve placing payloads at padA technician turns a switch to move the Payload Ground Handling Mechanism (PGHM) during the transfer of the STS-106 payload to Atlantis on Launch Pad 39B. A new AutoPGHM system with electronically controlled motors was used to transfer the payload. Below, the payload canister for STS-106 arrives at the Rotating Service Structure of Pad B. The payload was removed from the canister and lifted via the PGHM to be installed in Atlantis  payload bay. SPACEPORT NEWS Page 4 Sept. 8, 2000NOAA ...(Continued from Page 1)ATLANTIS ...(Continued from Page 1) with improved imaging and sounding capabilities that will operate over the next 12 years. Like other NOAA satellites, NOAA-L will collect meteorological data and transmit the information to users around the world to enhance weather forecasting. The data will be used primarily by NOAAs National Weather Service for its long-range weather and climate forecasts. The satellite will continue the support of the international COSPAS-SARSAT system by providing search and rescue capabilities essential for detection and location of ships, aircraft and people in distress. The polar-orbiting satellites monitor the Earth, tracking atmospheric variables and providing atmospheric data and cloud images. They track global weather patterns affecting the weather and climate of the United States. The satellites provide visible and infrared radiometer data for imaging purposes, radiation measurements, and temperature and moisture profiles. The polar orbiters ultraviolet sensors also measure ozone levels in the atmosphere and are able to detect the ozone hole over Antarctica from mid-September to midNovember. Each day, these satellites send global measurements to NOAAs Command and Data Acquisition station computers, adding vital information to forecasting models, especially over the oceans, where conventional data is lacking. NOAAs environmental satellite system is composed of two types of satellites: Geostationary Operational Environmental Satellites (GOES) for national, regional, short-range warning and now-casting and the polarorbiting satellites for global, longterm forecasting and environmental monitoring. Both GOES and POES are necessary for providing a complete global weather monitoring system. Both also carry search and rescue instruments to relay signals from aviators and mariners in distress. These satellites are operated by NOAAs National Environmental Satellite, Data, and Information Service in Suitland, Md. NASAs Goddard Space Flight Center in Greenbelt, Md., is responsible for the construction, integration, launch and verification testing of the spacecraft, instruments and unique ground equipment. Kennedy Space Center, lead center for Expendable Launch Vehicle Launch Services, is managing the launch for NASA. NASAs comprehensive on-orbit verification period is expected to last until approximately 45 days after launch when NASA will hand over formal NOAA-L operations to NOAA. Lockheed Martin Missiles and Space Co., Sunnyvale, Calif., built the spacecraft, under contract to Goddard. Data from the NOAA spacecraft is issued by researchers within NASAs Earth Science Enterprise, a long-term research program designed to study Earths land, oceans, atmosphere, ice and life as a total integrated system. Lu and Malenchenko will conduct a 6-hour space walk on the fourth day of the flight to hook up electrical, communications and telemetry cables between Zvezda and the Zarya Control Module, whose computers handed over commanding functions to the Zvezdas computers in late July. Lu and Malenchenko will also install a magnetometer to the exterior of Zvezda. The magnetometer will serve as a three-dimensional compass designed to minimize Zvezda propellent usage by relaying information to the modules computers regarding its orientation relative to the Earth. Burbank, who is a space rookie, will serve as the space walk choreographer. Mastracchio, also a space novice, will be the prime robot arm operator for the mission, using the Canadian-built arm to move Lu and Malenchenko around the ISS as they conduct their assembly work. Mastracchio is backed up on arm operations by Altman. Morukov will be responsible for unloading supplies from the Progress vehicle during the docked phase of the flight. On the fifth day of the flight, Atlantis crew will enter the ISS, opening the hatch for the first time to Zvezda and to the Progress. They will begin unloading 1,300 lbs of goods from the Russian craft for the first resident crew. The supplies include items ranging from clothing to medical kits, personal hygiene kits, laptop computers, a color printer, vacuum cleaners, food warmers for Zvezdas galley, trash bags and critical life support hardware, such as an oxygen generation unit and a carbon dioxide removal unit. The first toilet for the ISS will be delivered to Zvezda on the last day of the crews work inside the Station for installation this fall once the Expedition 1 crew is on board. Among the first tasks facing Atlantis crew will be the installation of three batteries and associated electronic components in Zvezda and replacement of two of the six batteries in the Zarya module, completing the work begun by the STS-101 crew in May. Zvezda was launched from Baikonur on July 12 with five of its eight battery sets already installed. Lu and Malenchenko will be in charge of the installation work in Zvezda. Also earmarked for Zvezda is the activation of two gas masks, which will serve as standard emergency equipment for ISS crews, and three fire extinguishers.Space Shuttle Atlantis, atop the Mobile Launcher Platform and CrawlerTransporter, inches its way to Launch Pad 39B. Page 5 SPACEPORT NEWS Sept. 8, 2000 KSC leads NASA in technology awardsOxygen delivery system to be used by Air ForceBarry Slack, at left, the NASA biomedical electronics technician who created the Medevac Oxygen System kit pictured, works with Greg Lowdermilk, a pararescueman with Patrick Air Force Base and program analyst for the Department of Defense Manned Space Flight Support Office (DDMS). Slack consulted with Lowdermilk in designing the system. It was originally designed to provide therapeutic oxygen supply to astronauts being flown aboard the C-130 aircraft in case of a forced landing at a Space Shuttle Transatlantic Abort Landing site.Among the technological innovations recognized during the Technology Award luncheon was the Medevac Oxygen System. The system, created by NASA biomedical electronics technician Barry Slack, was originally designed to provide therapeutic oxygen supply to astronauts being flown aboard the C130 aircraft in case of a forced landing at a Space Shuttle Transatlantic Abort Landing site. Through an intergovernmental agency technology transfer, the system is now being incorporated into the U.S. Air Force Air Mobility Command for use in C-130s and C-141s. The Southern Technology Applications Center at Kennedy Space Center facilitated the technology transfer to the Air Force. Slack created the system, which fits in a watertight case, in response to an inspection of medical resources at a TAL site. The inspection showed the existing oxygen distribution system would not cover a scenario when the majority of astronauts being transported would need oxygen. An expanded system was needed, but the cost was a staggering $1.25 million. Before beginning to design the new system, Slack consulted with staff at Patrick Air Force Base about how the system could be designed to best service a C-130. Pararescue-man Greg Lowdermilk, program analyst for the Department of Defense Manned Space Flight Support Office at Patrick, was particularly helpful, Slack said. It makes me feel good to know that lives could be saved because of this system, which is inexpensive and easy to build, Slack said. Each new kit costs only approximately $1,300 in materials plus the cost of pressure regulators to build. Slack built eight systems, six are kept in Germany and two are spares kept here at KSC. Slack, who works in the Biomedical Lab at Kennedy Space Center, equips Black Hawk helicopters with medical supplies to support potential medical needs for astronauts during launch and landing. A Technology Awards luncheon was held at the Radisson Resort in Cape Canaveral on Aug. 17 to honor NASA and contractor inventors for their technical contributions to KSC during Fiscal Year 2000. A total of $175,000 was received by 98 inventors, up from $140,000 in FY 99 and $97,000 in FY 98. This was a year of firsts for KSC in the Space Act Awards arena. KSC took first place among the NASA centers in total Space Act Award dollars received. For the first time in the history of NASA, the same inventors were on a Centers Software of the Year and Invention of the Year award submissions. For the first time, NASA licensed a U.S. patented invention to a foreign company. Kennedy Space Center is currently first for this fiscal year in the number of licensed technologies in the Agency; and For the first time in 10 years, a KSC innovation won the U.S. Space Technology Hall of Fame award. All these honors show we will be a success as a Spaceport Technology Center. They are an indication that we are doing the job NASA has asked us to do: Produce useful technologies, said Center Director Roy Bridges. The Space Act Awards program was authorized under the Space Act of 1958 to provide official recognition and to grant equitable monetary awards for those inventions and other scientific and technical contributions that have helped to achieve NASAs aeronautical and space goals. The awards are also designed to stimulate and encourage the creation and reporting of similar contributions in the future. As keynote speaker Alan Ladwig, director of Washington Operations for SPACE.com, said, Invention allows us to explore and appreciate the world in ways that may have seemed like science fiction only a short time ago. Space Act Awards are given for innovations that have been reported in NASA Tech Briefs ; commercial quality software approved for public release by NASA; and for patent applications submitted by NASA. Board Action Awards are awarded by the NASA Headquarters Inventions and Contributions Board to technology submissions that are judged to be of significant scientific or technical value. This years technical contributions include Universal Signal Conditioning Amplifier; Medevac Oxygen System; Low-Differential Pressure Generator; NOx Scrubber to Fertilizer; Focal Plane Array Imaging System; Enhancement of Zero Valent Metal Treatment of Contaminated Groundwater By the Use of Ultrasound; Cable and Line Inspection Mechanism; and Multipurpose Inspection Software RD-40. John F. Kennedy Space Center Managing editor. . . . . . . . . . . . . . . . . Bruce Buckingham Editor. . . . . . . . . . . . . . . . . . . . . . . . . . Kathy Hagood Editorial support provided by InDyne Inc. Writers Group. NASA at KSC is located on the Internet at http://www.ksc.nasa.govUSGPO: 533-128/00040Spaceport News Spaceport News is an official publication of the Kennedy Space Center and is published on alternate Fridays by the Public Affairs Office in the interest of KSC civil service and contractor employees. Contributions are welcome and should be submitted two weeks before publication to the Media Services Branch, XAE-1. E-mail submissions can be sent to Katharine.Hagood-1@ksc.nasa.gov Page 6SPACEPORT NEWS Sept. 8, 2000KSC team honored for GPES web toolSpaceport to host communityA Kennedy Space Center team that designed a web-based tool to help meet NASAs goals was recently honored by the U.S. Office of Personnel Management (OPM). Known as the Goal Performance Evaluation System (GPES), the tool helps with strategic planning, communication and alignment of resources. The GPES tool combines organizational management with human resource management. The tool allows an employee to document his or her work accomplishments via the Internet, and then to see how those accomplishments fit into the overall NASA Strategic Plan. GPES helps both the worker and the supervisor track job performance and goal achievement. Other centers, such as Johnson Space Center, also are interested in using GPES. A JSC team implemented GPES in only 90 days. GPES got its start when a KSC integrated project team was asked to design and deploy a centralized automated system for planning, monitoring, and evaluating NASA civil servant employee performance. The core team included Lesa Roe, Carol Valdes, Michael Bell, Mike Hill, Chris Carlson, Jennifer Kunz, Lisa Collorado, Charlie Quincy and Rick English. OPM selected the team as one of three recipients of an Honorable Mention for the PILLAR Award. The PILLAR Award, standing for Performance, Incentives, and Leadership Linked to Achieve Results, is an OPM honorary award established by the director of OPM to recognize and publicize effective management practices. The time has arrived to begin gearing up for the first Kennedy Space Center/Cape Canaveral Air Force Station Community Appreciation Day. Last year this event was the annual employee Open House, but this year Center Director Roy Bridges and 45th Space Wing Commander Brig. Gen. Donald Pettit have decided to open their facilities to the local community. On Nov. 4, spaceport doors will be open from 9 a.m. to 3 p.m. to a select number of car pass holders from the surrounding community. KSC and CCAFS will have the opportunity to share their people, unique facilities and one-of-a-kind launch vehicles with visitors who might otherwise not have an opportunity to see the space program at close range. Car passes for employees will be available at KSC Exchange stores and at Brevard County libraries. The Open House committee will provide more information in upcoming KSC publications.New SGS helium pipeline to save program moneyA new high-pressure helium pipeline is being constructed to service launch needs at Complex 37 at the Cape Canaveral Air Force Station (CCAFS). The nine-mile-long, buried pipeline for Complex 37 will save NASA money through sharing use and costs of the Kennedy Space Center Helium Facility. It also will serve as a backup helium resource for Shuttle launches. Nearly a launch worth of helium will be available in the pipeline to support a Shuttle pad in an emergency. Space Gateway Support (SGS), the Joint Base Operations and Support Contractor (J-BOSC) at KSC and CCAFS, is responsible for design and construction of the buried pipeline. The Boeing Co. is providing funding for the project. NASA will assume ownership and operation of the new pipeline as soon as it is completed. Construction began in June and is expected to be completed in September. When completed, the pipeline will be capable of delivering helium pressurized to 6,000 pounds per square inch (psi) from the KSC Helium Facility. The KSC Helium Facility, currently operated by SGS, has a capacity of 1,800 standard cubic feet per minute at 6,000 psi. High pressure helium is now being delivered via an aboveground pipeline from the Helium Facility to the Shuttle launch pads, the Vehicle Assembly Building and the Orbiter Processing Facility. Other users of pressurized helium currently rely upon high-pressure gas railcars (in support of Titan), compressed gas trailers (Atlas Centaur and Delta II/III), and Kbottles (institutional shops and laboratories).A construction photograph shows the new helium pipeline along the road to Complex 37. SGS built and Boeing funded the new pipeline.